Maria Keller was pregnant with her fourth child when she visited her doctor for a routine ultrasound at 20 weeks and was confronted with a moment all mothers dread. Maria and her husband, Joe, suspected something was not quite right when the ultrasound technician suddenly became quiet as she caught the first glimpses of the couple’s unborn child on the ultrasound screen. Then the technician abruptly exited the room, leaving Joe and Maria waiting for a few tense minutes before they were called in to see the doctor, who met them with a distressed look on his face. The ultrasound had revealed that their son, who would later be named James Nicholas, had osteogenesis imperfecta type II, a genetic bone disorder that causes collagen deficiency and defective connective tissue. Most babies diagnosed with OI Type II die within the first year of life of respiratory failure. “We were frankly told that we shouldn’t expect James Nicholas to survive birth, and that if he did survive to prepare for it to be a matter of seconds or maybe a couple of minutes, if we were blessed,” Joe told CWR in an interview. Until recently, it was not uncommon for delivery room doctors to seize babies with lethal anomalies immediately after birth. The belief was that it would be less traumatic for parents not to hold or even see babies who would likely die soon after birth. Today there is better recognition that deep maternal-fetal bonding can take place. But a strong anti-life bias persists against unborn and newborn babies with fatal conditions. There is broad public support for abortion of unborn children with profound disabilities. According to a 2006 poll by the National Opinion Research Center, 70 percent of Americans believe a woman should be able to obtain a legal abortion if there is a strong chance of a “serious defect” in the baby. Most unborn babies who receive a severe or fatal diagnosis are aborted. Cheri Shoonveld, a genetic counselor and spokesperson for the National Society of Genetic Counselors, estimates that only 10 to 20 percent of women carry to term after learning of a terminal prenatal diagnosis. In her book For the Love of Angela, Nancy Mayer-Whittington tells the story of her daughter Angela, who was diagnosed prenatally with Trisomy 18, a genetic disorder associated with a life expectancy of just 30 days. When Mayer-Whittington informed her doctor that she would be carrying Angela to term, he told her she was his first patient carrying a child with a life-threatening diagnosis to choose not to terminate. A woman’s decision whether to bring a baby to term or abort after a fatal diagnosis can hinge on whether alternatives to abortion are offered, and whether she has the necessary medical and emotional support from her husband and other family members, clergy, and health-care providers. A growing perinatal hospice network provides parents with a life-affirming alternative to abortion. It offers advice to parents—on how to cope with and grieve for their baby, how to tell family members and others about their baby’s diagnosis and their decision to bring him or her to term—as well as instructions on how to care for their baby at home before death. A small 2007 British study found about 40 percent of pregnant women with fatal prenatal diagnoses continued when perinatal hospice was offered. In 2006, Minnesota enacted the first law in the nation to offer prenatal hospice as an alternative to abortion when the unborn child is diagnosed with a fatal condition. Devout Catholics, Joe and Maria Keller never considered abortion, and say they had positive experiences with most of the succession of doctors they saw during Maria’s pregnancy. But a high-risk obstetrician urged Maria to abort and tried to console her by telling her that if she got pregnant again she would be able to obtain prenatal genetic screening early in the pregnancy. This, Maria was told, would allow for the early detection of any fetal abnormalities and time to abort before she got emotionally attached to her child. The Kellers’ experience highlights the pro-abortion prejudice held by many medical professionals toward babies with severe or fatal diagnoses. A study by the American College of Obstetricians and Gynecologists found that 90 percent of its surveyed members support abortion for fatal fetal anomalies, and 63 percent support abortion for non-fatal anomalies. A 2000 study in the journal Prenatal Testing and Disability Rights found that a quarter of physicians admitted trying to influence mothers’ reproductive decisions, usually encouraging them to abort. Other studies have found that many pregnant women feel pressured to undergo invasive prenatal testing, then, if the test comes back positive for a disability in their child, to abort. White says that physicians sometimes use callous or misleading terms such as “grossly deformed,” “lethal anomaly,” or “incompatible with life,” which can give parents an inaccurate picture of their child’s condition and may inadvertently encourage them to abort. In For the Love of Angela, Mayer-Whittington writes about the special challenges that confront women who carry babies with fatal conditions to term. Breaking the news to people was practically a trauma in itself. They were so shocked and unprepared, and many could not hold back tears. They had no idea what to say to me and just nodded wordlessly as I tried to comfort them. At a time when I was in dire need of consolation…I frequently found myself placed in the position of consoling other people. Mayer-Whittington later co-founded Isaiah’s Promise, a support group for parents continuing a pregnancy after a severe or fatal diagnosis in the Washington, DC area. As with women who abort generally, some women who abort babies with fetal anomalies later experience intense grief. Theresa Bonapartis of Lumina, a post-abortion referral network, told CWR that she has seen a significant rise in recent years in the number of women who seek out grief counseling after aborting a child with an adverse diagnosis. But women who abort babies with disabilities have special post-abortion counseling needs. Most plan to give birth and abort only after prenatal testing reveals a disability. Typically, the usual reasons given for abortion—immaturity, lack of support, poverty, or inconvenience—are not present. Most of the pregnancies, in other words, are “wanted”—until the disability is detected. The grief associated with disability abortion is often made more intense by the fact that most disability-related abortions take place in the second or third trimesters. Be Not Afraid offers free pastoral care for parents experiencing a poor prenatal diagnosis. It is a network of concerned parents and professionals who have experienced or worked closely with issues surrounding poor prenatal diagnosis. In late October, more than 60 people gathered in Charlotte, North Carolina for a two-day conference organized by Be Not Afraid. Speakers from several Catholic dioceses and disability advocacy groups made presentations, as did pro-life physicians, several priests, and three mothers who had been helped by Be Not Afraid. Some attendees were interested in establishing similar ministries in their dioceses or communities. By this Daniels meant that many well-intentioned family members and friends of mothers of unborn babies with difficult diagnoses will try to avoid the women out of doubt about what to say or concern that they’ll say the wrong thing. But in many cases mothers wish to talk about their pregnancies, and appreciate friends who engage them about their experiences. Volunteers were encouraged to try and cut through the euphemistic language that medical personnel often use when describing the pregnancy and the child. Jan Benton, executive director of the National Catholic Partnership on Disability, talked about the importance of not trying to comfort mothers by telling them that the diagnosis might be wrong. “That’s like saying ‘Yeah, a child with a disability would be the end of the world,’” Benton said. When a mother gives birth to a dying child, a lot must be done in a short period of time. The delivery room can be a chaotic rush of family members, photographs, and religious rituals. The mothers at the Be Not Afraid conference all talked about the importance of memory-making, which involves lots of photos before, during, and after birth. Memory-making also may include planning funerals, making outfits for the baby, making hand or foot impressions, constructing memory books full of ultrasound pictures, locks of hair, congratulatory cards and mementos from the hospital, and more. The Kellers made special bracelets for themselves and their other children to wear to remind them of James. Mayer-Whittington took lots of pictures and did many other things—including planting a tree—to help her remember her daughter’s brief life, which she called “Angela moments.” “I had this huge need to talk about Angela, an incredible desire to validate her existence to everyone,” she wrote. In 2004, National Catholic Bioethics Center issued a statement titled, “Early Induction of Labor.” It affirmed that the Church considers the early induction of labor because of a poor or fatal prenatal diagnosis to be an abortion. As the number of older mothers increases, and as the use of assisted reproduction—including in vitro fertilization—continues to rise, so might the number of unborn babies with severe and fatal disabilities. 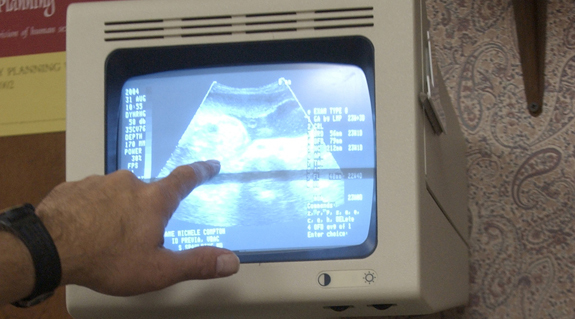 In 2007, the American College of Obstetricians and Gynecologists began recommending that all women be offered prenatal screening for genetic conditions. And very soon prenatal tests will be widely available that can screen for hundreds of genetic defects much more cheaply and less invasively than do current tests. Advances in biotechnology present an opportunity for groups like Isaiah’s Promise and Be Not Afraid. They offer an opportunity for them to spread their message that, while a fatal prenatal diagnosis can mean a lot of tears, it can also be an invitation to a more focused and deliberate love.